BRISBANE, Australia (AP) — Nick Stiles has been appointed as head coach of the Queensland Reds on a two-year contract, given outright control of the job he has shared with Matt O'Connor since Richard Graham was released early in the season. The Reds, champions in 2011 but struggling near the bottom of Super Rugby now, conducted an international search before settling on Stiles, who played 96 games in the front row for Queensland and 12 tests for Australia. Stiles started coaching after retiring as a player in 2006. He spent six years as an assistant coach in Super Rugby and guided Brisbane to the first two titles in Australia's National Rugby Championship in 2014 and '15. 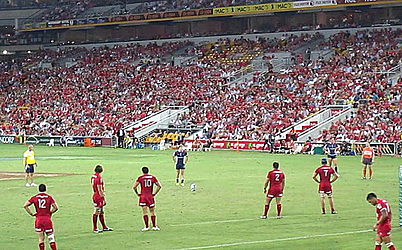 The announcement precedes the expected return of playmaker Quade Cooper to the Reds after a stint in France.